>What’s in my purse today? Amy Ruiz Fritz April 19, 2011 April 19, 2011 No Comments on >What’s in my purse today? > The other day, I was digging through my purse at work not because we were playing a Let’s Make a Deal do you have an oven mitt in your purse for $100 game, but my OCD was kicking in and I needed to make sure my keys weren’t locked inside my car for the 3rd time that morning. 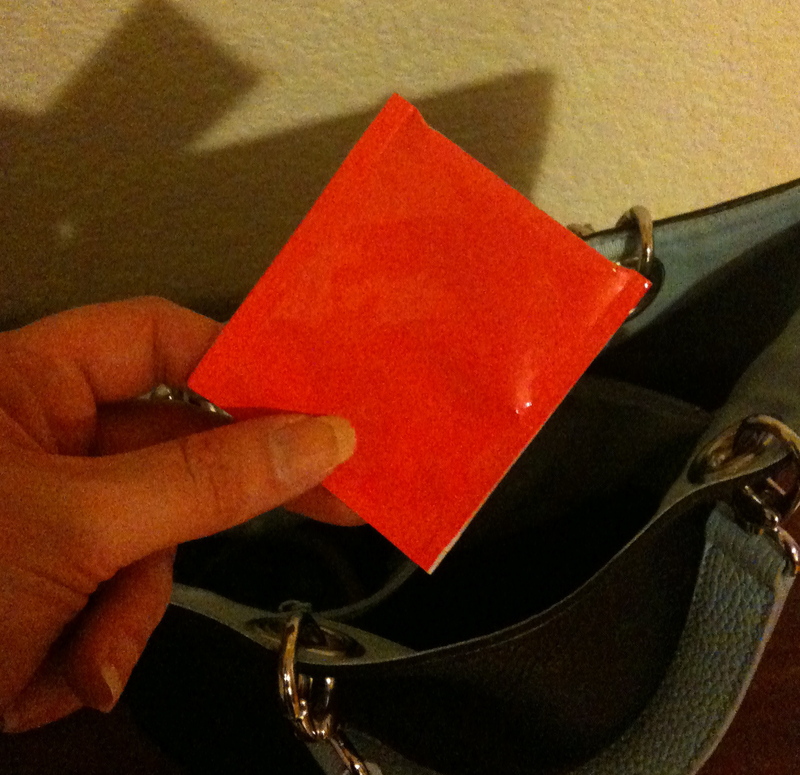 As I was searching through my purse, the depth of which is reminiscent of Mary Poppin’s magical bag, I pulled out this pink packet and set it on my desk. Suddenly, I realized what this might look like to a passerby and shoved it back in. Of course, it wasn’t a colorful condom. If you’ve been reading my blog over the past few months, you know I’m in a bit of a dating dry spell. It was a tea bag. Weeks ago on a rainy Sunday, I had tea with my cousins at the Linda Lane Tea Room in Dixon. It was nice, but not really my style. While I’m quite the girly girl, as a kid I never had tea parties with my teddy bears or dolls. I was too busy dressing up Barbie, playing video games, and watching cartoons. Regardless, at the end of the “meal” the server gave us all a packet of strawberry tea. Being the quasi-pack rat I am, I shoved the freebie in my purse and forgot about it until I started to die of unfounded embarrassment at work.